Hammer. Tell the truth now,--how many times have you picked up a hammer and thought it would be fun to hit something as hard as possible, instead of lightly tapping a nail into the wall? 2. 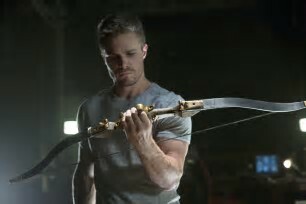 Oliver Queen's Bow and Arrows. Over the course of 6 seasons, his bow and arrows have gone through multiple iterations. No matter the season, his aim is always impressive...as is his hood. never seen its equal. And can anything top the fencing scene? What is your favorite weapon? Leave a message and let us know! Fun post, Erin! 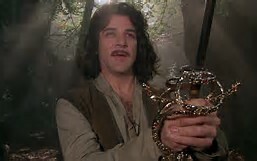 Ha, Inigo Monotoya is the best :) I always liked the bows and arrows of the elves in the LOTR series! Ooh, I love this topic! I'm partial to swords, so of course I have to mention Anduril from LOTR ("reforged shall be blade that was broken /the crownless again shall be king. "), the sword of Martin the Warrior from the Redwall books (it's made of metal from a meteorite- how cool can you get?) and Dyrnwyn from the Prydain chronicles. Of the three, Dyrnwyn has the most interesting backstory and is the most powerful- but Martin's sword has been used by so many amazing characters! So I'm torn between those two. In other news, I also love all of Wonder Woman's weapons (lasso, gauntlets, "godkiller" sword and shield) and Batman's batarangs. And every single lightsaber from Star Wars! Wow,Brenna! Great ideas...how fun! Thanks for sharing! I like archery equipment too, and swords. I'd have to add a staff as well. My vote is more for Inigo as a person rather than his sword. :-) I'd have to go with a lightsaber or a staff. Because there is nothing cooler than taking an ordinary broom handle and beating the stuffing out of someone with it. :-) Fun post!